Awwww, those are just cute as can be! You're so talented!!! They are adorable! Thanks so much for the pattern. Well, aren't these the cutest little things? Thank you so much for sharing! These are too cute! Thank you so much for sharing the pattern! So cute and thank you for sharing. It doesn't get any cuter!! 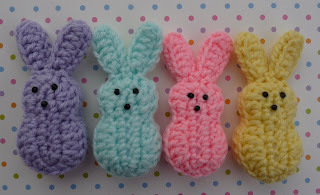 I could eat them.hah.ah.aha..a.
I just just found you on Ravelry. Love your bunnies - just adorable! Thanks for sharing your pattern. I'm making them for my grandkids! Happy Easter to you! Hope you get some peeps. Love these bunnies!!! Thanks for posting the pattern! So darling, love them!!! Thanks for the pattern. They would make a cool garland. Uma Feliz Páscoa para você e os seus. These bunnies are soo cute!! I have to try them. They look just like the real marshmallow ones!! These are perfect! 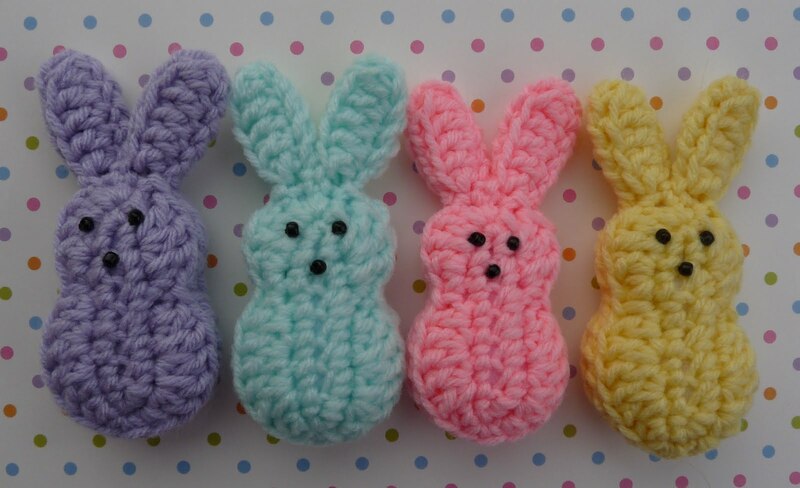 My 12 year old DD is addicted to Peeps and I am going to stitch some of these for her Easter Basket. Thanks! This is adorable! Thank you for such a sweet and easy tutorial. I featured your pattern in my Pinterest Party today! Aawww! How cute! Thanks for the pattern! The cutest! I must make some. Now. Oh my, how great is that`? Due to health-issues, my grand-daughter is not supposed to get that much chocolate for Easter, so I am looking for some alternative: your bunnies are soo cute! Thanks a lot for sharing the pattern. I have loads of wool-stash (made a granny square blanket), so will now sit down and try to make them. It's officially Easter. I love the bunnies. I need to make a dozen for my Sister. Wonderful pattern, thank you so much for sharing! I made two of these for my mother and she went wild! Son una monada estos conejitos. Muchas gracias. Me han encantado.